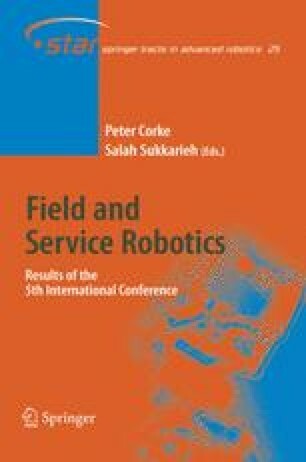 This paper presents a novel design and a motion planner for a semipassive mobile robot. The robot consists of an upper circular body and three identical semi-passive driving mechanisms. Each mechanism consists of a passive wheel that can freely roll, a rotation actuator along the normal axes and a linear actuator for motion along the radial direction of the upper body center. The robot is equipped with an inclinometer to measure the surface slope. Each wheel is also equipped with a rotational encoder to measure roll. Using an odometric model, data from these encoders determines vehicle position. Kinematic analysis provides tools for designing a motion path that steers the robot to the desired location, and determines the singular configurations. Due to the passive roll, there is no longitudinal slippage, and lateral slippage is determined from the kinematic and odometric models. This enables accurate and reliable localization even with slippage. A gait pattern planer for downhill, as well as horizontal and uphill surfaces is presented. A prototype robot has been built and field tested. Experimental results verify the suggested models.